Standard credit card size plastic cards. Black is available in a matt or gloss finish with black or white edges. Translucent can be printed in full colour. 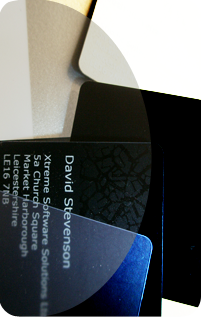 Printing in silver, gold or white inks can look particularly effective. We have a stock of specially manufactured part silver metallic and part white so that a full colour photograph can be printed onto an unusual card. These cards can be hole punched to accept a lanyard clip.